Published in Rafu Shimpo, September 19, 1968, English and Japanese sections. Clair White of the Santa Anita Bonsai Society examines a bonsai created by the Society for the Third Annual Bonsai Festival to be held September 28-29 at Descanso Gardens in La Canada, California, September 17, 1968. Older Caucasian man in eyeglasses and sweater sits on table as he touches top one of three bonsai plants at right; small one in center. 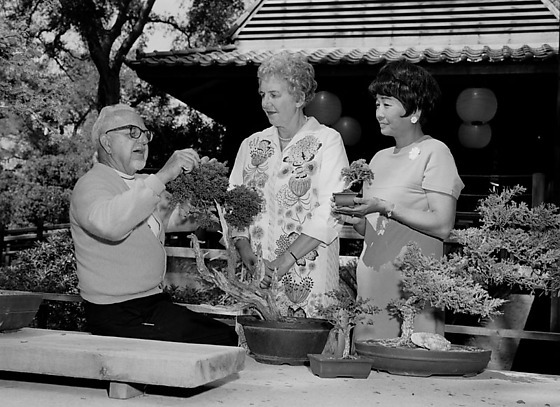 Mrs. Judge Smith of the Descanso Garden Guild, the festival sponsor, stands in center next to Mrs. Khan Komai, wife of Society president, who holds a tiny potted bonsai in her hands at right. Circular lanterns hang under pagoda roof in background. Typed on original envelope: Descanso Gardens -- Bonsai Tree.